Read our customers' honest and impartial Ford B MAX car reviews and ratings to easily find your next car at Motorparks. Very good on petrol. Lots of space, I have two grandchildren with cars seats and each still has lots of room. The folding back doors are so easy for lifting out little ones and also easy for adults to get in and out - No stressing that the door is open whilst getting children in and out. Good drive, very smooth. No negatives at all. Dees were very helpful - car ready when we needed it to be. Having had my B-Max now for a few weeks, I could not be happier with the car - it is smooth to drive and very comfortable, vision is excellent and I personally would recommend this car. Although the doors of the B-Max are heavy because they need to be, I like the flexibility of the sliding doors which make this car one of easy access. Love the car, great to drive, well worth the money paid for the car. Great car and great sales people at Ford Wimbledon. I really enjoy driving my new Ford B-Max, it's really comfortable and is surprisingly fast whilst still being economical on petrol. It's a real joy to drive. Had this now for 2 months and has not let me down I travel 50 miles to work and back and just can find no fault with my Ford B-Max TDCi - fantastic on fuel £54 pound to 500 miles plus very comfortable drive - easy to use the sliding doors, which is a big bonus, and just love the car - well done Ford. 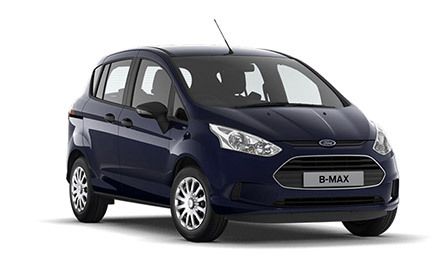 I am absolutely delighted with my Ford B-Max, it is a pleasure to drive and really comfortable. The car, what can I say, it's a dream, Mr Ford, your inspiration for the people to enjoy driving was a gift. Having decided to change my 3 year old Ford Focus automatic Titanium x for a new Ford B Max automatic Titanium x as I do not need a 7 seater C max. I was surprised at the changes to the position of the controls on the steering wheel and the lack passenger footwell lighting. Already I can see an improvement in the average mpg and the handling is equal to the Focus. It does take less items in the boot with the seats up of course, but having two load areas does help. The front seat belts are on the seats and not on the central pillar as there isn't one and that does take time to get used to. The heater seems more efficient and the sliding rear doors are certainly a bonus in tight parking spaces, when one has one shopping bag and also for passengers to enter and exit the vehicle. On the whole I am extremely pleased with the B Max. My B-Max replaces a Fiesta. It certainly meets the two criteria that I was seeking. The driver's position is higher, as is access into the driving seat. This is a comfortable position to be seated even on longer journeys and still comfortable after several hours of driving. The second criterion was to have more storage space. In this respect the car is truly remarkable. Interior storage space in the boot area is significantly easier to utilise, especially with the rear seats lowered. The driver's overall viewing perspective is enhanced by the higher positioning. The side frames of the windscreen do require the driver to exercise some caution as they create minor 'blindspots' which characterise most cars. This car does demand the driver to use the correct gear or there is a drop-off in fuel consumption. I have enjoyed the 'pull' of the 1.0 turbo when required. It cruises comfortably on motorways and handles well when under load. I am surprised that one of the rear brake lights is non-functioning so soon 7 weeks after purchase. For me this has been a good change of car and I look forward to many more years of using it. Love my new car, the B-Max is great to drive and I felt so confident on the test drive after my last car was written off. I still need something a little bigger as I've got 3 growing boys 9, 7 and 6. Not a lot of boot space, which is a let down but still love it. After having a 1.8 Zetec petrol C-Max which finally was written off, I was looking for something that would be similar and found the B-Max fitted what we were looking for, the height of seating on getting in and leaving the car was the same but more comfortable, sliding rear doors very useful especially in parking situations with the shopping. Impressed with the fuel economy after the other car. The change gear indicator is very useful. Gearbox excellent - usual slick shifting. Very comfortable seating. Very happy with the car. An easy drive and very comfortable. The boot space is quite small but adequate for day to day use. Love the heated front windscreen, especially in the recent cold weather. I am very impressed and pleased with my new BMAX. Excellent drive and comfort but best of all is the ECOboost engine have been pleasantly surprised by how good it really is. The car is quiet, easy to drive, economical and very comfortable. Also, because the seating is 'higher' than a normal car, you don't feel vulnerable. A car to be recommended, certainly.